Precarious work has become a very fashionable term in recent years. We hear about it in the media and public discourse; it is also a subject of much academic debate. The discussion revolves around the growth of atypical work and increased insecurity of employment, which is the main characteristic of precarious work. There are some who claim that nearly all work is now precarious, however most focus on the so-called ‘objective’ or ‘contractual’ precarity attached to flexible contracts, which are not typical, as in full-time and permanent. Precarity is not a new phenomenon and its growth predates the recession. Atypical employment has been on the increase since the mid-1970s and was already quite high during the boom. It could be argued, however, that its volume as well as its nature has changed over the last decade. 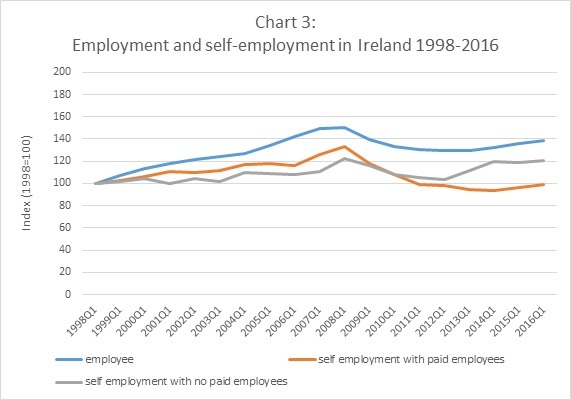 There are now more precarious workers in Ireland in terms of numbers and the insecurity has grown after the economic downturn. Objective precarity involves three main types of employment relationship: flexible part-time (irregular hours); short-term contracts; and self-employment with no paid employees. The first type involves workers who may have a contract of indefinite duration, however their weekly hours vary. They are usually on so-called ‘zero-hours’ or ‘if-and-when’ contracts and either have no guaranteed hours of work or the number of hours is set at a minimum level. In other words they have long-term security of employment but no short-term security of income: they may be on full hours one week and then have only a few the next week. Temporary contracts are objectively precarious as the job will end at a certain point in time. Self-employment which doesn’t involve any paid employees is also likely to be precarious as it depends on the (in)security of contracts, which are not guaranteed. The insecurity these two types of work has more of a long-term character and depends on the supply and demand side of the labour market. Temporary work is the only form of atypical employment that has fallen recently. 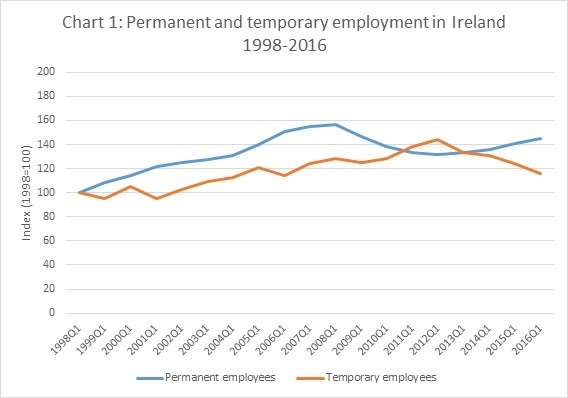 This may suggest that its growth was linked to the recession and that those who were initially hired on a short-term basis, have now moved on to permanent jobs. Part-time work, however, as well as self-employment with no paid employees, are still growing areas of the labour market. 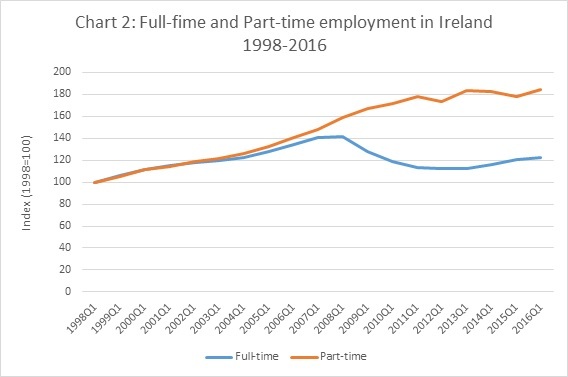 Part-time employment has also been growing before the recession as well as after, which could be a sign of a long-term shift. Some may argue that there is nothing worrying in those trends. In fact, the concept of a ‘job for life’ has been contested since the 1970s ‘revolt against work’ and the turn away from the Fordist type of employment which was initiated by the workers. Back then the term precarious work was associated with low-skilled segments of the labour markets. Highly skilled, on the other hand, had option of being ‘flexible’, but this flexibility was often not directly linked with insecurity. This was still the case in Ireland during the boom. Part-time work, undertaken by students and cosmopolitan migrants was perceived as ‘cool’ rather than precarious. Short-term contracts were not viewed as a problem for the highly-skilled as they could find another job easily. Finally, self-employed suited many who wanted to be more independent. There is, however, evidence of that changing since the economic downturn. In our recent research on ‘Working Conditions in Ireland’, we found that many people are now forced to accept flexible, precarious contracts. There is often no choice in variable hours in hospitality, construction workers are told to become self-employed by larger contractors, while some highly skilled workers (especially newly graduated) have no other choice but to take on short-term jobs. What could be the case is that more than a decade ago many people wanted to have flexible employment; now they are forced to do so. This could be the reason why precarious work is now such a popular term: the objective precarity might not have been an issue for those who were choosing to be precarious, it is however problematic for those who now have no other option.